My name is John Watts and my law firm helps Alabama consumers who are facing foreclosure to stop the foreclosure without filing bankruptcy. Join me on this short journey and I trust you will find this time well spent as you look for how to save your home from a foreclosure. The mortgage company (whether Nationstar/Mr. Cooper or Wells Fargo or Bank of America or whoever) wants you to believe that the train heading towards foreclosure cannot be stopped. Unless you reinstate the loan — that is pay off what is owed. Or you file bankruptcy — a life-changing event where, ironically, the mortgage companies often make more money off of you. You will feel absolutely hopeless. But there is a secret they don’t want you to know about . . . because it changes the game. You can sue your mortgage company before a foreclosure to stop the foreclosure! This is the secret plainly hidden in your mortgage. So your mortgage is the document that secures the loan to your property (“the debt to the dirt”). It also gives the mortgage company the right to foreclose if you break your agreement. Your mortgage company definitely wants you to know this — it has the right to foreclose. Here’s what it does NOT want you to know — the same document (mortgage) and normally the same paragraph that gives the right to foreclose also gives you the right to have a court look at your situation before a foreclosure. In Alabama, the foreclosure is “non judicial” which means no court or judge is involved. Your mortgage company — you know, the guys who committed so much fraud and nearly destroyed our economy — we trust them to foreclosure. The only basis? They say they have the right to foreclose. No judge looks at whether they really have the right to foreclose. No judge considers your defenses. You take advantage of the right given to you (by your mortgage company) in the mortgage. Pull out your mortgage. If you don’t have it, then you can get it from the Probate Court where your property is located. Acceleration; Remedies. Lender shall give notice to Borrower prior to acceleration following Borrower’sbreach of any covenant or agreement in this Security Instrument (but not prior to acceleration under Section 18 unless Applicable Law provides otherwise). The notice shall specify: (a) the default; (b) the action required to cure thedefault; (c) a date, not less than 30 days from the date the notice is given to Borrower, by which the default mustbe cured; and (d) that failure to cure the default on or before the date specified in the notice may result in accelerationof the sums secured by this Security Instrument and sale of the Property. The notice shall further inform Borrowerof the right to reinstate after acceleration and the right to bring a court action to assert the non‑existence of a defaultor any other defense of Borrower to acceleration and sale. If the default is not cured on or before the date specified in the notice, Lender at its option may require immediate payment in full of all sums secured by this Security Instrument without further demand and may invoke the power of sale and any other remedies permitted by Applicable Law. Lender shall be entitled to collect all expenses incurred in pursuing the remedies provided in this Section 22, including, but not limited to, reasonable attorneys’ fees and costs of title evidence. If Lender invokes the power of sale, Lender shall give a copy of a notice to Borrower in the manner providedin Section 15. Lender shall publish the notice of sale once a week for three consecutive weeks in a newspaper publishedin ____________ County, Alabama, and thereupon shall sell the Property to the highest bidderat public auction at the front door of the County Courthouse of this County. Lender shall deliver to the purchaserLender’s deed conveying the Property. Lender or its designee may purchase the Property at any sale. Borrower covenantsand agrees that the proceeds of the sale shall be applied in the following order: (a) to all expenses of the sale, including,but not limited to, reasonable attorneys’ fees; (b) to all sums secured by this Security Instrument; and (c) any excessto the person or persons legally entitled to it. Mortgage companies love the “power of sale” (foreclosure) but they passionately hate your right to bring a court action! The notice shall further inform Borrower of the right to reinstate after acceleration and the right to bring a court action to assert the non‑existence of a default or any other defense of Borrower to acceleration and sale. This is the default letter or default notice. This must be sent before the acceleration of the loan occurs. Well, does it really have to be sent or is this a suggestion? “Shall” this is not a suggestion. It is not a “should do” — instead it is a “must do”. 100% must happen. This is not a suggestion. It is not a “should do” — instead it is a “must do”. 100% must happen. So what does the notice have to do? The mortgage company must tell you. It is not enough to say, “Well the homeowner can check the mortgage.” Nope — the agreement that the mortgage company wrote and gave you to sign says the mortgage company must inform you. It must tell you. Is this “informing” something that is optional or maybe it will tell you that you might possibly, perhaps, someday have the ability to do something? This is not a maybe or a possibility. You have the absolute right to do this. The lawyers defending these crooked mortgage companies often argue, “Judge, since the homeowner was behind he has no rights under the contract.” Pure garbage. The whole point of this paragraph is when the mortgage company says you are behind. This lets you know that this “right” you have is something you must do. You cannot wait. Don’t expect to be sued for foreclosure because that is not how foreclosures happen in Alabama. (Florida is different — you will be sued for foreclosure in Florida). You sue your mortgage company. You become the plaintiff — the one starting the lawsuit. No more waiting around for the hammer to fall on you. So what do you do in the lawsuit you file against your mortgage company? This means you make claims. You want the court to look at certain arguments or to look at evidence. What sorts of arguments or evidence do you want the judge to examine? This is where you tell the court that you are not actually in default. We have had mortgage companies lose thousands, even tens of thousands of dollars, that were paid to it by the homeowner. Or your mortgage company says you have not kept insurance on the propert — and you have. But it still plans on foreclosing. You bring this to the court’s attention so it can rule there is no default. But what if you are in default — is there any hope? “Other defense” means there is some defense you have to the acceleration of your loan. “Acceleration” means the entire loan is due right now. “Sale” is the foreclosure sale. You now know what the default letter has to say if you have paragraph 22 (or some equivalent) in your mortgage. If the default letter does not strictly comply with your mortgage, then there is no right to foreclose. You have the right to be considered for loss mitigation (loan modification, short sale, etc). But what if your mortgage company does not allow you to do this? This illegal act is something you want the judge to consider as she decides whether your home can be foreclosed. This is what is often known as “dual tracking” where your mortgage company tells you that you are being considered for loss mitigation but then it intends all along to foreclose. Picture two trains — one on the loss mitigation track and one on the foreclosure track. There are strict rules under RESPA (Real Estate Settlement Procedures Act) on when this is forbidden. If you are a victim of this, let the judge know as this may influence whether there can be a foreclosure. This is a general argument — simply put, if your mortgage company has no right to foreclose, then this is a great defense to bring up with the judge. There are countless reasons that can prevent a foreclosure — we cover a few of them here. The bottom line is to look at your situation very closely with a skilled foreclosure defense lawyer and see what persuasive arguments you can make. This is an old trick but often the old tricks come back around. Here, Wells Fargo or Ocwen or Nationstar/Mr. Cooper, etc. send you one letter. It is a default letter. But this is not allowed in your mortgage — read paragraph 22 above. The sequence is a default letter, 30 days, and then an acceleration letter. Same words — totally different meaning. This is one we are seeing very often here in late 2017. You are told there is a foreclosure set for October 16. It has been advertised in the paper (see paragraph 22 above). You may want to have the court look at this when dealing with a mortgage company that sends you contradictory information. About the most important thing — the sale date! These mortgage companies are obligated — by law and in the mortgage — to follow various regulations and rules. If they don’t follow them, then is this a defense that can be raised before a foreclosure? You have to decide but there are some very good arguments that not following the rules/regulations takes away the right to foreclose. 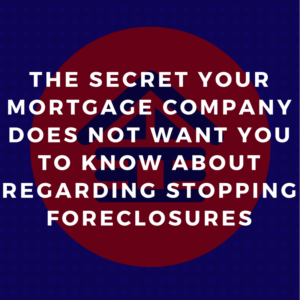 So what do you do with the knowledge of this secret that foreclosure mortgage companies don’t want you to know about? You now know what your mortgage company wishes you did not know. Understanding the right to bring a court lawsuit before a foreclosure is so critical to stopping a foreclosure. If you just learn this and take no action — you wasted your time. And I failed you because my goal is for you to take massive action with this knowledge. First, pull out your mortgage if you haven’t done this already. Do you have language in your mortgage similar to paragraph 22? Second, what does your default letter say? Does it match your mortgage? Third, when is your foreclosure set? Fourth, do you have a foreclosure defense lawyer who can help you stop your foreclosure without filing bankruptcy? Fifth, are you prepared to take massive action to save your home? Willing to spend time and money to save your most valuable asset? If you are ready for us to walk you through this process, then give us a call at 205-879-2447. Tell the receptionist you have a foreclosure set and what day it is set. Then ask to speak to Randi and she will help you gather your information and we will help you understand your options. Or you can fill out the form below and we’ll get right back to you! We look forward to helping you stop your foreclosure without suffering the terrible consequences of bankruptcy. PS — if you want additional information, you can click on the links below. Remember, information is critical but knowledge alone won’t save your home. Don’t get caught in the trap of thinking that more knowledge is the key. It is half the key. The other half is you must take massive action on the information/knowledge you gain. We are here to help you understand your options (gain knowledge) and to encourage and help you take action to save your home. I have a mortgage with Me COoper but I’m in Louisiana, any information you can give me on someone here to talk to ? Use this link to start with — hopefully, you can find someone to help you with mortgage issues. It can be difficult dealing with Mr. Cooper (Nationstar) so definitely find a lawyer you feel good about to help you there in Louisiana.